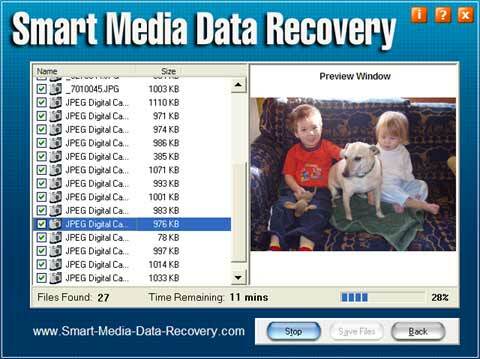 Recover Photos with Smart Media Recovery Software. The first wizard screen of the program displays the storage devices connected to your computer. You should see your Smart Media Card listed as a drive letter, e.g. F:\, with the size of the drive written next to the drive letter. If you do not see the card as a drive letter, check that your camera or card reader is correctly connected to your computer and press the 'Refresh' button, which will re-list the available drives. In some data recovery situations the drive letter may no longer be accessible by your computer as a drive letter. In this case you should look for the "physical drive that is the same size as your Smart Media Card". Place a tick in the box to select the drive to search for deleted photos. Once you select the drive to search, press the 'Start' button to start searching for deleted photos. The program will then start searching your camera card to recover pictures and it will display them in the results window as it finds them. Click on a recovered photo to display the contents of the picture in the preview window. If you can preview a recovered photo then it can be saved once the program is activated. Purchase a product activation key from this web site and enter it into the program (press the orange "i" button and then click "activate"). You must then save the recovered photos back to your computer hard drive. 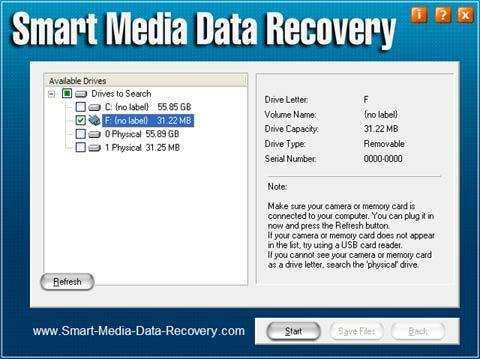 Do not write files back to your Smart Media Card until you have recovered all the photos. The software is designed to recover SD and recover XD cards. It will work with Smart Media, Compact Flash, Memory Stick and other types of removable storage media.